What can we learn from religious figures who heard voices? Today research into the experience of hearing voices is typically done within a biomedical paradigm. Although this has furthered our understanding of the causes of hearing voices, it has also limited certain aspects of our understanding of the phenomenon. When researchers try and understand what the phenomenon of hearing voices is like, they typically do this against the backdrop of their contemporary theories of what causes voices. What theory they hold can bias them towards making certain assumptions about what voices are like. Today, the assumption, held by some researchers, that voices are random productions of a diseased brain (a position I do not subscribe to) shapes their view of the hearing voices experience. This view can lead to the idea that the content of voices is unlikely to be meaningful, useful or related to the person’s life. Thus, when asking people about their voices researchers do not enquire about these potential facets, and hence they are sidelined. This is problematic for a number of reasons, one of which is that we don’t get an accurate picture of the phenomena that we are trying to explain. How could a visitor from another planet understand what humans were like if they only ever dropped in when we were having wars? (yes, I know we’re always having wars, but you see my point). This problem, is related to what elsewhere I’ve termed ‘theory-phenomenology drift’ (Laroi, de Haan, Jones, & Raballo, 2010), in which there is a tendency for what theories of x explain, to drift apart from the actual phenomenology of x, coming eventually to concentrate only on a subset of the varied phenomenology of x. This problem has long existed, and has manifested in a variety of ways. For example, as Leudar and Thomas (2000) have noted, the French psychiatrist, Pierre Janet (1859-1947) disbelieved certain aspects of what his patients told him about phenomenology of their hallucinations (what they were like) because they were not consistent with the model of hallucinations he held. One way to get a different sense of what properties of voices and visions our presently dominant biological/medical model may cause us to overlook is to head back in time to a different time, culture, and context, which didn’t have a predominantly medical view of such experiences. 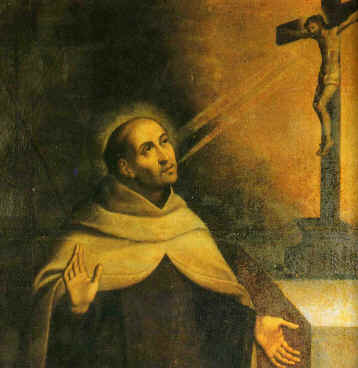 One such account is given by the 16th century Spanish theologian, St John of the Cross. St John of the Cross has been called the greatest psychologist in the history of mysticism. He was a member of the Catholic Order of Our Lady of Mount Carmel, which was characterised by prayer, silence, meditation and contemplation. Just like the early Desert Hermits, silence and contemplation seems to have opened the door to voices and visions for St John. He was born in a poor family in Spain in 1542, and led a varied and dramatic life, at one point being imprisoned for nine months in solitary confinement in a dark, cramped cell, measuring only 6 by 10 feet. After an escape worthy of Errol Flynn, made using a rope constructed from strips of bed-sheets, he spent the rest of his life writing, guiding, praying and directing the spiritual development of others across Spain. It has been written that no person knows what to do with the divine when it falls into their hands. Fortunately for us, St John decided to write about it, and he left behind him a systematic analysis of his experiences, which he termed supernatural communications. When we look at St John’s analyses of these experiences, we find that there are a number of experiences that he describes that are not given significant attention by contemporary research. The first can be called ‘voices that save’. St John classified hearing voices (or ‘locutions’ as he termed them) into three types: successive, formal and substantial. The latter type, substantial locutions, is probably the most interesting. “one of these words works greater good within the soul than all that the soul itself has done throughout its life”. St Teresa of Avila, a colleague of St John’s, also noted that people who heard phrases such as “It is I (God), fear not” found them exceedingly powerful, calming and influential, and the memory of these voices could last for a lifetime. Such powerful and positive voices are still reported today. For example, Heathcote-James (2001) cites a contemporary account of a healthy woman, in a distressing situation, hearing a voice saying “But you have trust in God”. As a result of this, the woman described how she “felt great consolation and joy. I just cannot describe the sense that I felt, it was so beautiful it was indescribable”. These voices often seem to occur when people are in danger, under stress, or under physical or existential threat. For example, the mountaineer Joe Simpson, after a horrific climbing accident, was forced to crawl for four days back to his friends’ base-camp. During the latter stages of his agonising journey he began to hear a voice which was “clean and sharp and commanding” and which told him to “Go on, keep going”. These are clearly not random productions of a diseased brain. In a biological/medical model that ignores the meaningfulness or usefulness of voices, such experiences get swept under the carpet. “one never thought would or could happen, so that the imagination cannot possibly have invented them”. This highlights the potentially creative nature of such experiences, and links into the relation between voices and creativity. Today, scattered reports show that voices can give novel and creative information. For example, authors report receiving inspiring and novel ideas directly from their voices and visions (Malone, 2006) and many personal accounts highlight the novel and original nature of such experiences (e.g., Romme & Escher, 1993). However, this aspect of AVHs is not formally researched today. This is possibly again due to the bio-medical paradigm encouraging the idea that AVHs are simply random, worthless productions of an abnormal brain. Overall, St John of the Cross’s writings show that his era was able to identify aspects of voices and visions that have been neglected by the modern biological/medical model. St John was well aware of positive, useful voices, as well as voices that give novel and original information, which have been mainly ignored by psychiatry today. When voices and visions become medicalised there is the risk that all such experiences are seen as worthless symptoms of an illness. Thus, it may be that it is only once we widen our stance to include other viewpoints in addition to a biological/medical model, that we can really start to understand voices. Jones, S.R. (2010). Re-expanding the phenomenology of hallucinations: lessons from sixteenth century Spain. Mental Health, Religion, and Culture, 13, 2, 187-208. Cangas, A.J., Sass, L.A., & Pérez-Álvarez, M. (2008). From the Visions of Saint Teresa of Jesus to the Voices of Schizophrenia. Philosophy, Psychiatry, & Psychology, 15, 3, 239-250. Heathcote-James, E. (2001). Seeing angels. London: John Blake. Laroi, F., de Hann, S., Jones, S.R., & Raballo, A. (2010). Auditory verbal hallucinations: dialoguing between the cognitive sciences and phenomenology. Phenomenology and the Cognitive Sciences, 9, 225-240. Leudar, I., & Thomas, P. (2000). Voices of reason, voices of insanity: Studies of verbal hallucinations. London: Routledge. Malone, D. (Producer and Director). (2006, June 18). Voices in My Head [Television broadcast]. London: Channel 4. Romme, M., & Escher, S. (1993). Accepting voices. Shaftesbury, UK: Mind.